Hokuriku Kako JSC is a fireworks company located in Ishikawa prefecture, Japan. It was founded in 1953 in Shizuoka prefecture. In 1997 both the main office and the factory were moved to Ishikawa prefecture and everything was renewed. Now we have the newest equipment in all Japan. Big scale production facilities are so few in Japan that they can be counted by the fingers of just one hand, and we are one of those companies. We have the leading equipment of our industry and we keep a high level of safety and technology. On the factory everything is put in order and located according to the safety measures based on the Explosives Regulation Law. 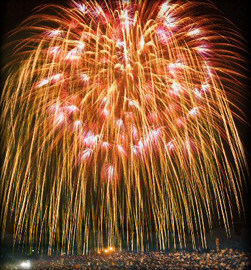 We keep traditional techniques of Japanese firework, and all our professionals team up with regular stuff to produce high-quality fireworks. At the launching itself all firing is programmed on the computer. We put our efforts into combining traditional techniques and foremost technology thus aiming at the best fireworks shows and events. In 2004 we received a prize from Ishikawa Prefecture Explosives Safety Association that recognized our long-time efforts and achievements in fire guarding. In Japan the regulations are very strict, but our company got an official recognition for the safety measures we take. Ground area 19,707 square meters (6,000 Japanese tsubo).